Lisa Lacasse is the president of the American Cancer Society Cancer Action Network (ACS CAN), the nonprofit, nonpartisan advocacy affiliate of the American Cancer Society (ACS). She leads an organization of more than 200 staff in Washington, DC and across the country in support of laws and policies that help people fight cancer and advance the ACS’ mission. Since joining ACS CAN in 2007, Lisa has been integrally involved in helping to establish a nationwide public health advocacy organization that influences and shapes public policy at all levels of government. Her passion for representing the voices of all cancer patients and their families is exemplified in her leadership. In her former capacity as deputy president, Lisa managed a broad portfolio in support of ACS CAN’s advocacy priorities. The focus of her work was on strategic integration and organizational alignment across the enterprise. Her responsibilities included organizational development and training, volunteer engagement and grassroots strategy, media advocacy, public policy, finance, governance, human resources, and all ACS CAN operations. She oversaw ACS CAN’s One Degree campaign – a three-year grassroots effort calling on Congress to increase federal funding for medical research at the National Institutes of Health (NIH) by $6 billion, including $1 billion for cancer-specific research at the National Cancer Institute (NCI). In 2018 – in a pivotal moment in the fight against cancer – the goal of the One Degree campaign was realized. The influx of funding will lead to more ways to prevent and detect cancer at its earliest, most treatable stages, better treatments and new cures. Lisa and her team were also instrumental in making sure that critical patient protections were included in the Affordable Care Act so that comprehensive health insurance was available, without discrimination, for people with pre-existing conditions such as cancer. Since the law’s passage in 2010, Lisa has led ACS CAN’s dedicated efforts to safeguard these hard-won, lifesaving patient protections. Lisa received a Master’s of Business Administration from the Wharton School at the University of Pennsylvania and a Bachelor of Arts degree from the University of Vermont. Before joining ACS CAN, she was the chief financial officer at the National Institutes of Health (NIH) Clinical Research Center, a 242-bed, clinical research hospital where she was responsible for the planning, formulation, and execution of a $345 million annual budget. 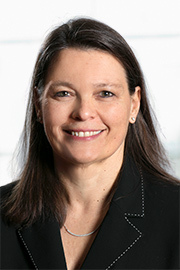 Prior to NIH, Lisa spent several years in senior management at the University of Maryland Medical System and began her career in the office of the Governor of the State of Maine. Lisa lives Bethesda, Maryland. She loves nothing more than spending time with her husband and four children in her beloved home state of Maine. Lisa shares her thoughts on patient advocacy, public policy and ACS CAN’s role in the fight against cancer on her Cancer CANdor Blog and on Twitter at @LLacasseACSCAN.